I gravitate toward stereo3D movies, due to my history of making stereo3D films. I wrote an article about stereo conversion for The Force Awakens, recounting its masterful use of the stereo3D format. In my opinion, Doctor Strange was a tour-de-force example of fantastic stereo3D conversion, so based on the Director’s comments, I thought it worth my while to eventually check out all the hype on the new HDR format — and no better time to try than with the new film Rogue One: A Star Wars Story. Rogue One is fantastic fun! The 9-year old inside me leapt for joy, and I feel it is easily the fan fiction we all imagined after the first Star Wars erupted into cinemas of the day. 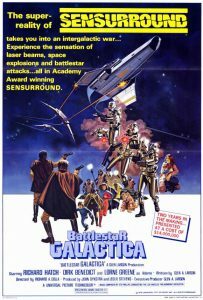 It neatly recreates the feeling of Star Wars in 1977, as well as the zeitgeist of the time. The story originated with Visual Effects pioneer John Knoll, and is deftly directed by former Visual Effects practitioner Gareth Edwards. From cinematography, acting, and music to visuals — stunning! 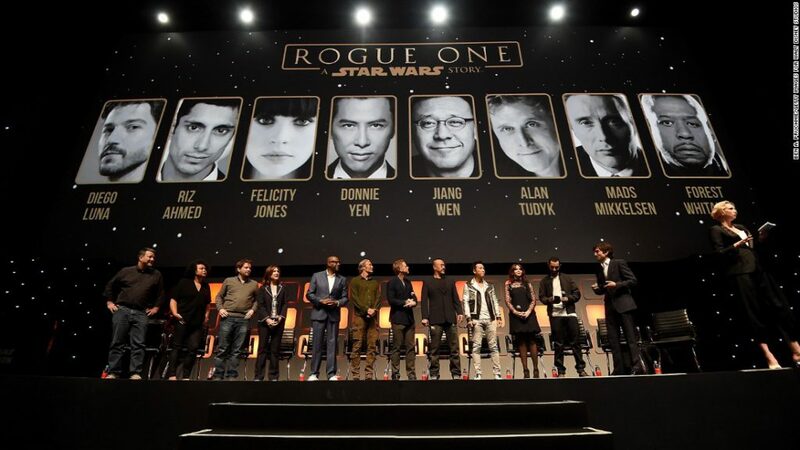 John Knoll, VFX supervisor, shares the stage for Rogue One in a new role. He originated the story idea. Of particular note, is that the Visual Effects team perfectly recreated miniatures and craft from 1977 in digital form, which provide the Death Star and its surroundings the appropriate scale and menace which it occasionally lacked in the original. Doug Chiang and his team expertly blend the aesthetics of original Ralph McQuarrie, and Joe Johnston designs with bits of the Star Wars Rebels and Star Wars prequels — building a fully realized universe for all of Star Wars, that was originally felt as an evolution from picture to picture. I have very few concerns with the film. The only one that really sticks in memory, is the first sequence of Rogue One. It felt uncomfortably dark, but as the movie progressed, that seemed to have been the choice of the filmmakers, rather than that of 3D glasses, or a projector with its bulb intensity turned down to save money. Brighter scenes with greater contrast followed, and overall a better balance was struck for the rest of the show. The visual effects were stunning across the board, especially in their ability to make the universe and locations feel real. It was exciting to see Peter Cushing in the film, and the visual effects team pulled it off. In Rogue One, Tarkin is a malevolent power hungry man — a side of his character we did not fully enjoy in 1977 — his digital visage supported that. Color balance and editing were dynamic per environment, and slowly began to move toward the color, framing, and cuts of the original Star Wars film. We will discus Vader later. If you see Rogue One in stereo3D, see it in an IMAX3D theater, if you can. The Force Awakens also had an IMAX3D version, and I readily sing the praises of the stereo3D on that movie — which holds up beautifully in home viewing. There are so many 3D projection systems, like Real-D, and Dolby3D in the marketplace, but the IMAX3D system stands out for several reasons. The IMAX 3D system uses two projectors synchronized for stereo3D projection, one for each eye. This is a significant improvement over most other systems in two ways. First it is significantly brighter, and since you are wearing polarized lenses (like sunglasses) to isolate the 3D images, highly preferable. Secondly, with the dual system projector the viewer sees each set of stereo images at the same time. With other single projector systems, you have one lamp (occasionally at its proper intensity) providing stereo images in quick succession, Left, then Right — flashed several times per frame. This can occasionally cause minor stereo errors during cuts from one shot to the next, and at times reveal a lag that the human eye detects as an object at a different stereo depth. In High Frame Rate (no HFR for Rogue One release – thank goodness) this anomaly is more apparent, so the IMAX 3D double system is preferred. As far as the glasses are concerned, IMAX3D uses linear polarizers, and most other systems use circular polarizers. The different types of polarizing lenses are required due to the size of the IMAX screen, and the requirement to eliminate “crosstalk,” or interference between the two distinct stereo images. The advantage of a polarized system is that the glasses are cheap, and light. You can also acquire clip-on polarizing lenses if you wear prescription glasses. 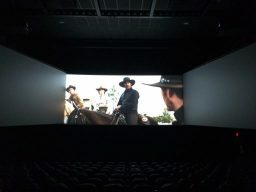 Dolby3D projection uses a specialized anaglyph method, which alters certain colors per eye, and the glasses are very heavy in comparison, and do not fit well over glasses, resulting in greater viewer fatigue. Xpan-D systems, which use updating liquid crystal lenses as masks, have a noticeable flicker, are very dim, and extremely heavy. (I once had to wear a pair upside down on the bridge of my nose in India, because the eyes were flopped in the projection system — ouch!). All of these 3D projection systems are digital these days, providing a steady image. As a film experience, Rogue One in stereo3D is almost a completely different film than its 2D counterpart. Despite the size of an IMAX screen, a Stereo3D film almost always feels as if you are watching a personal movie. Attempts to put extra depth into wide angle shots, as seems to be the norm these days for converted content, often makes large vistas feel as if you were watching them on a view master. They do not feel as if you were outside in the world of the film, as much as you would like. However, the personal relationships you develop with actors and objects are far more rewarding. It is a more immersive format, which makes the films content more subjective, and almost touchable. Good stereo3D images actually make you feel as if the 3D was not even there, as your mind fully accepts it — unless something is wrong. In Rogue One, you can understand the space, move your eyes around, and almost feel the texture of the cloth, or closely analyze the form of the actors and hardware in front of you. For the most part the characters are beautifully sculpted, especially Jyn Erso, and K2SO. You get to know these individuals, examine their faces and understand every nuance of them. K2SO feels like it is manufactured from heavy industrial metal, not just because of the shading but because of the way we feel the three-dimensional volumes in stereo3D. Jyn is now someone we get to know in the kind of close proximity you would a friend. 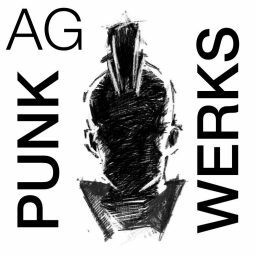 I only felt inconsistencies in facial sculpture for a few shots of another character in the narrative, but this is an outlier within the entire scope of the project, not worth directly flagging. You could see that the actors were mostly physically fit sculptures, not just cut-out forms with shading on them. 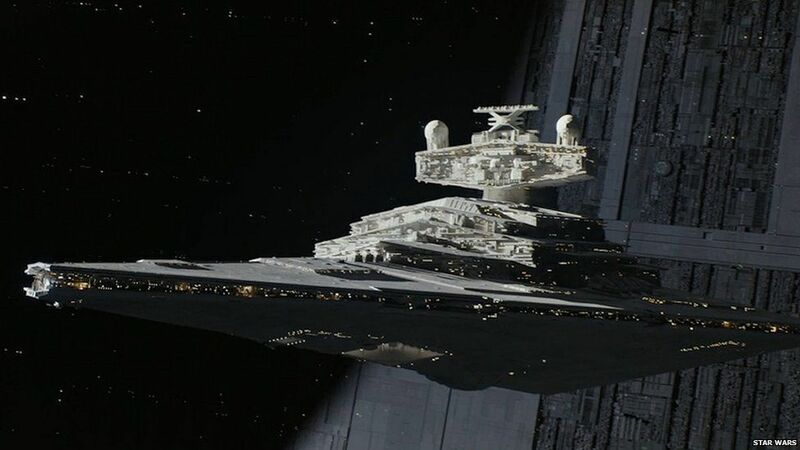 The trailer shot of the star destroyer coming out of the shadow of the Death Star assembly is truly stunning in 3-D. It is actually stunning in all formats, but the amount of 3D displacement — which is far more than you would see in real life — provides the same sense you get standing in front of an actual Star Wars miniature. The resurrected digital actors actually have more impact in stereo3D than in 2D. Although the movement is occasionally stilted at the lips — which is a challenge of animation — seeing it in 3D made me appreciate the characters much more and accept them in their role in the film more than in the 2D. I believe this phenomenon may be similar to the reasons high frame rate imagery is seemingly higher resolution, when it is only more information. Since we have a stereo image, we get twice as much information about the forms, and that increases the inherent resolution of the 3D objects, even when converted to stereo. Although they are clearly digital, as Peter Cushing has passed on, the dramatic impact of their characters is enhanced in stereo3D. In many ways the stereo3D enhances perception of things which literally flew by in the standard 2D screening. Of particular note is the shield gate guarding the planet, which emphasizes details that are easily missed in the 2D version. Stormtroopers walking along catwalks, characters inside of windows, all of the little bits and pieces of Star Destroyers tumbling through space — as well as the dangerous drop inside the records vault. The environments feel dimensional and real. The jungle, grass and rock detail in this film are fantastic, and those are traditionally some of the most difficult for stereo conversion artists. Every detail of those was so beautifully sculpted in this movie, that you could literally feel them with your mind. You understood what they were made of, how they felt to your fingers if you were to touch them. They provide more visual movement to the frame because somebody took time to do them with love (and presumably little sleep). That is very good use of 3D depth sculpture, and I applaud it. Camera lens choice has a significant impact on stereo3D, and this might be where the stereo3D version lacks a bit. As humans we expect things closer to us to have more depth and perspective, as our eyes are “normal” lenses, with a fairly wide Field of View. This is how we are trained to see in 3D. Longer zoom lenses reduce the differences in scale between foreground and background images, and compress the visual distance — often with a visually appealing shallow focus — this shot should logically have less 3D volume, as the objects are farther away. Much like shallow, and shifted focus, our mind will concentrate on that area of the frame with the greatest depth, and if more depth is assigned to something we know should feel flatter, we shift our attention. It is up to the stereo conversion artists to find this balance, often compressing or expanding depth artistically to shift the depth Focus to the proper level of the shot. Rogue One seems to favor longer lenses, and in 3D occasionally falls into the trap of too much depth in the distance of wider shots, when it should be in the foreground, in an attempt to push the scope of the film, but instead losing the main point of the shot. It is in these moments that you say to yourself “cool 3D,” and are taken out of the narrative. So far, very few stereo converted films get by without artifacts, due to production schedules. However we are a far cry from the debacle of Clash of The Titans in 2010. The stereo3D artifacts in Rogue One (those things we all want to avoid, but sometimes get past us) were mostly based around paint errors that were not as off-putting as the paint errors in Star Trek Beyond earlier in the year (which made me not purchase the 3D bluRay). There were some missed reflections in glass, or dirt on glass that ended up being in the background rather than in the foreground — which were corrected in the next shot. This seems to be an artifact of time, in that the stereo3D teams have the least amount of time of anyone on the production, since they are nearly the last to receive it — essentially a second complete Visual Effects team that waits until everyone else is done. I am sure the scramble to finish was epic. As a viewer, these anomalies are easily missed, unless you are looking for them (which is my job). Technically as far as stereo3D goes I believe we are pushing artifact paint teams too far and too fast, and the cracks are starting to show. If you do not know what to look for, you will miss them. Stereo3D should not call attention to itself on purpose, but should enhance the story. If you have to boil Rogue One in Stereo3D down to one single takeaway that is unique from the 2D version, it is the following: Darth Vader. By far the most impressive stereo3D in this film is in the last few minutes of the end battle, during the Darth Vader rampage. Since we are in a more confined space, the lenses are necessarily more wide angle, approaching what you would see if in that room. The room feels claustrophobic in stereo3D. As mentioned earlier, Stereo3D is a personal experience, and in this case you are in that hallway being stalked and hunted by a Dark Lord of the Sith. In 2D, it was shocking and fantastic to watch, but the terror is almost palpable in stereo3D. I was out of breath watching it, with Vader standing in open space afterward as the plans to the Death Star slip through his fingers. Worth the ticket price for that alone. I would say over all of the 3D made the world more interesting sculpturally, but did not stand out to the point where it is indispensable to the film as I feel it is for The Force Awakens. It provides a greater appreciation for the environments, and especially during the Darth Vader rampage it is truly effective because it personalizes that moment for the audience. It provides a much more personal connection to Jyn Erso and her story as well, leaving us more feeling that her journey is ours. It was time to put the Director of Doctor Strange‘s perception to the test by watching Rogue One in DolbyVision HDR. I did not have a chance to see the film in 70mm, as there are few prints around. After this viewing I am not sure it would have been better. The DolbyVision cinema is steady and scratch free, and is a 4K image presented in expanded dynamic range. The Dolby logos at the front of the show dynamically show off what that extra brightness, and deep blacks can provide in contrast, and detail. The Atmos sound sweetly envelops your body along with comfortable recliners, and is never jarringly loud — but crystal clear. The deep thumps of the speakers shake the ground, bringing to mind all the hype of SENSURROUND in the 1970s. Truly a movie going experience worth the ticket price. I did not see it in Dolby 3D, as that would have added confusion to the format face-off, and I really dislike the dichroic anaglyph method, and heavy glasses Dolby uses. After the awesome intensity of the Dolby logos, I expected a rousing high contrast, bright film. However, I was disappointed with the opening scenes, as I was before in IMAX3D. The image is still a dark, cloudy sky, and as difficult to see as before. Later scenes expanded the contrast range, but never took full advantage of the format. On the other hand, the deep star backgrounds were perfectly black with crystal clear points of light. The image felt sharper, but was truly just higher contrast. The stand-out shot from the trailers, and every version of this film (which I also saw in standard 2D) of a Star Destroyer in the shadow of the Death Star is brilliant, and black. The detailed surface ripping out of the inky depths of space, next to the enormous, ominous shadow of the Death Star. Very nice. The visual effects hold up well, and the digital characters get another level of added detail from the sharpness and contrast. Michael Giacchino’s soundtrack, and the sound mix in general must be experienced in this format. 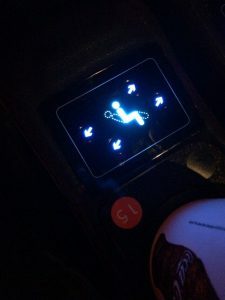 The comfortable recliners, and impressive sound system along with the 4K sharp image made you feel the ticket price was justified. An A-class experience. Due to my history of stereo3D effects, I gravitate toward that format, but I plan to see the next big film in this format first, directly from my experience with Rogue One. For good measure, lets mention a few other cinema systems that are currently competing for dollars, some of which did NOT have Rogue One. As mentioned, there s a 70mm version of Rogue One floating around. With modern film recorders, much of the higher dynamic detail is recorded out to the film with standard analog compression. I am not sure how saturation in a digital image translates to a this format, which can not exactly match it. Gate Weave, scratches, dust can all creep in — but I have seen incredibly stunning images from 70mm film, and I am sure Rogue One does not come up short. In many ways there is a nostalgia to the format that connects it to its progenitors. 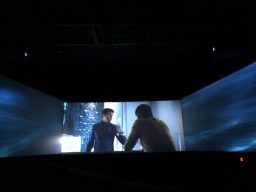 This summer I saw Star Trek Beyond in the unique wrap-around three screen system called Barco Escape. I hoped it would provide an interesting cinema experience, but it was a disappointment. The image seemed small as you tend to sit back and watch all the screens. The side screens keystoned, and the screen too high in a raked seating theater. Moving forward just left me with the feeling that I was missing part of the movie. I am glad that Rogue One avoided this format, as it has several problems, including light contamination from its own projectors. 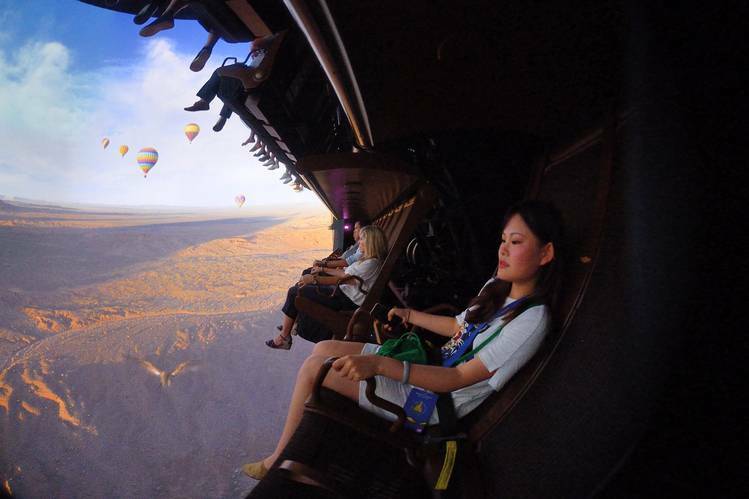 If you want a truly immersive experience, although with a 2D image, you still cannot beat the Disney Soarin’ ride showing at their parks. In the end there is a movie format for everyone that likes or dislikes it. 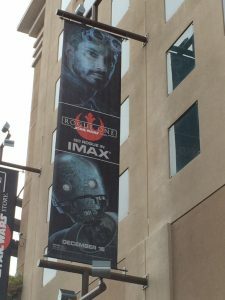 I found that each one was a unique experience, and I got to see three versions of Rogue One with the same story, but which had a different impact on me. I wish the stereo3D were as flawless as the Force Awakens was, but the errors I see are there because of my professional training to see them. I also wish that the color grade on the first scenes were better, and would have taken advantage of the light, but I agree with the director of Doctor Strange, that stereo3D and HDR formats are both worthwhile, and are the ones I recommend. To sum up. Rogue One in stereo3D, and DolbyVision are cinema experiences not to miss. It is not as strong a 3D film as The Force Awakens is, but Rogue One is something not to miss overall. Can all the children running in the aisles playing Star Wars rebel fighters after the movie as credits roll be wrong? It beats watching it on a smart phone.